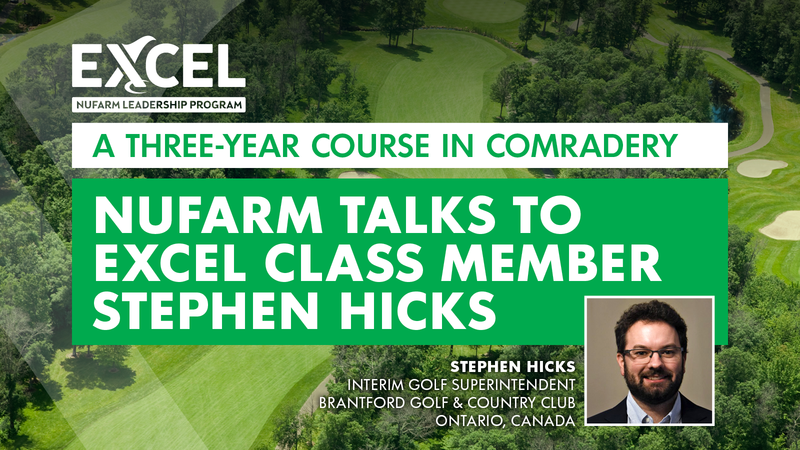 Excel Leadership Program class member, Stephen Hicks, is Interim Golf Superintendent at Brantford Golf & Country Club in Ontario. 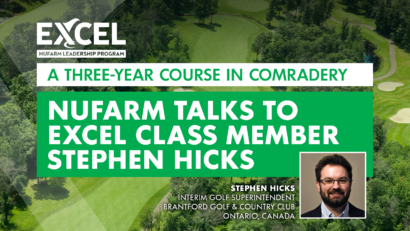 The Excel program, sponsored by Nufarm and GCSAA, offers immersive career, community and industry leadership training for assistant superintendents for a period of three years. Stephen is a member of the first 12-member Excel class, selected from dozens of applicants across the US and Canada in late 2017, that will conclude its first year of sessions next month at the Nufarm North American Headquarters in Alsip, Ill.
For Stephen, opportunities in golf turfgrass have a way of sneaking up. He was bitten by the golf bug at age 11 so his first indoor restaurant job as a teen left him grateful for his next job opportunity working outdoors at a small golf course in Nova Scotia. Still, as with many teens, he pursued a college career path outside of horticulture. He continued to work at the same course while receiving his undergraduate degree and wasn’t sure what he planned to do next. Meanwhile, his course superintendent, Dave Wilson, helped Stephen gain responsibility and learn new equipment. Dave eventually asked “What are you going do with your life?” Stephen wasn’t sure. Dave added “You know you’re pretty good at this. You have a good eye.” He then joked, “I’m appalled you don’t think this is a career path”. At this spark of inspiration, Stephen promptly attended the Turfgrass Management program at the University of Guelph. During Stephen’s two years at Guelph, he interned at a large golf club in Virginia. He was exposed to the significant contrast of his former small seven-member crew golf course in a relaxed country environment to a large 40-something staff with a helipad and intense expectations. After Guelph, he worked at Bayview Golf and Country Club in Toronto, cutting teeth with two great mentors that he values to this day for giving him the leeway to learn from an influx of projects. Just being selected for the Excel program, knowing that the progress was competitive and rigorous, has cemented Stephen’s belief that he is doing things the right way and should continue on this career path. “The greatest benefit has been confidence,” he explained. Compared to other networking and education opportunities, Stephen believes that Excel is unique in the sense that the commitment is three years and supports such a small, collaborative group. “The three-year commitment is reassuring that we’re not trying to cram things in. We can take our time with subjects, open our eyes to things we haven’t thought about, and really think about modern management. And it’s great just looking around the room and realizing you’re not alone,” said Stephen. He looks forward to gathering again next month in Alsip. “Obviously it’s always fun just to catch up with people, but you know in the northern part of the US and Canada, it was a very difficult growing season. Talking about that, feeling comradery again, knowing that we’re the next generation of leaders in the industry…those kinds of conversations are really good,” he said. The application period for the second Excel Leadership Program closes on Oct 1. Applicants can learn more at NufarmInsider.com. After learning about the inspiring nudge that started Stephen’s career in industry, we couldn’t help but ask his thoughts on how other young adults can be enticed to enter green career fields. Here’s what he had to say! “I was just reading about the complexities of the lack of labor, including educated labor in horticulture trades. (Our Excel class) talked briefly about the need to be creative and work with the staff you have and needing to train people up. There’s definitely a generational gap where teenagers now don’t consider working outside as a career option.” At 18 years old he recalls thinking the same.